I remember sitting with a music teacher talking about instruments when I was in 5th grade, I vaguely remember holding a clarinet but I ended up playing the flute because my cousin Audry had one she no longer played, and that is what my parents could afford. The first tune I ever played was Hot Cross Buns, my mom says I practiced it all the time, I don’t remember that. 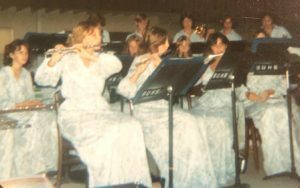 I do remember practicing my flute sitting on my bedroom floor, legs crossed, and music on the floor. Perhaps the fact that practicing my flute was fun, not like homework, is why I don’t remember how much i did it. 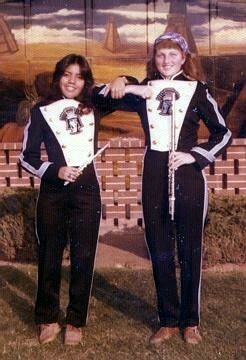 A few weeks prior to starting my Freshman year at Azusa High School, marching band rehearsal started. I don’t remember being bothered that band cut my summer vacation short. 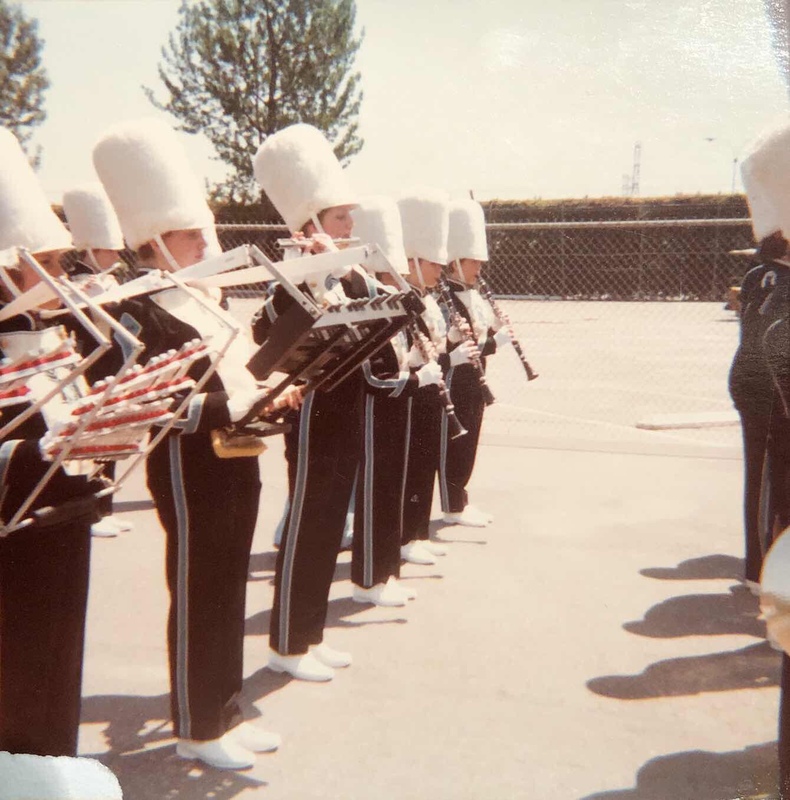 My very first performance with the Azusa Aztec Marching Band was marching onto the field of Angel Stadium in Anaheim to open a Dodger game with the Star Spangled Banner. I was hooked! The Azusa Aztec Marching Band was good, we won many awards. I had to memorize all my marching music, I still remember what our competition marches were. My Freshman year it was was Army of the Nile, the first march I memorized and as I type this I can her it in my head. French National Defile March my Sophomore year, “today-today-today, not tomorrow-tomorrow-tomorrow”. And The Southerner my Junior Year, (I might have my Junior and Sophomore years mixed up). We played the Southerner March in the community band a few years ago, it was fun playing one of our old marches. Except my 50+ year old eyes and the tiny little notes on that 6 3/3 x 5 piece of paper, I had to enlarge my copy so I could read it. Azusa High School Marching Band plays “King Karl King”, by Henry Fillmore in SCSBOA parade competition. The recording is from a reel to reel tape converted over the years to cassette then CD then mp3. The performance is from November, 1973 and the photo is of the band that season. Concert band was 5th period and marching band was 7th period (after school), we practiced halftime shows and did drill downs, but mostly did a lot of marching up and down Rockvale Avenue. Our rows, files, and diagonals had to be perfect, and my flute had to be parallel to the ground. A typical fall weekend would consist of a Friday night pep band at the football game, followed by T-Ping houses (for luck), then a Saturday morning marching band review. There was that infamous TP job of 1976… But that’s another story. Because we were a competition marching band the uniforms had to be perfect. We had white shoes with white bottoms. 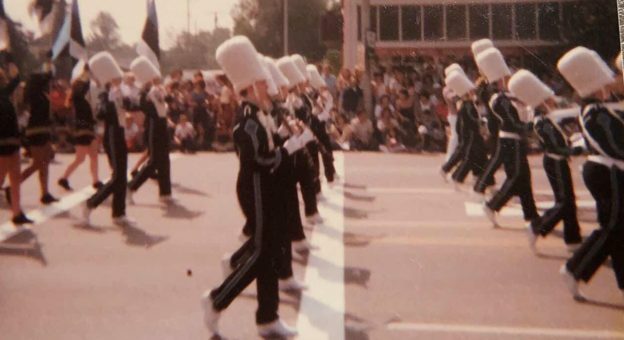 We had to scrub the bottoms of our shoes with Comet to get them white before every parade, only to step in horse poo during the a parade, (I hated parades with horses!) The uniforms were hot and sweaty wool, with tall white fuzzy hats. The hats looked like a Q-tip and all our hair had to be tucked underneath, band moms would walk around as we were warming up and tuck pose strands in with a Rattail Comb and the spray with Aquanet. Traveling to the band reviews was a blast, we got up early Saturday morning, loaded our gear, put on our uniforms, and bused to places like National City, Long Beach, Arcaida, and many more. During the parade we performed our best, and after we finished the parade we loaded back on our bus and changed into street cloths. Under our wool uniforms we wore socks, underwear, (girls wore a bra), and a cut off white tee, that was it. After the parade our cut off tee was usually soaked with sweat. We all changed on the bus together, boys and girls, ad took our sweaty tee shirt off. It wasn’t weird though. Our underwear showed no more than a bathing suit, and we were excited to get the the activities and the awards ceremony. The Maytime Band Review in National City was our yearly overnighter. Each year the “prank” was everyone flushing their toilet at the same time to “flood” the bottom floor. It was funny until I got the bottom floor. No flood. Hmmmm. Sometimes before the awards we had some free time to watch the other bands or do activities. At the All Western Band Review in Long Beach we were able to visit the Pike. I remember riding a big Ferris Wheel, it was dark and we could see the Queen Mary all lit up in the harbor. I rode that old Cyclone roller coaster too, It closed a couple years later. That same year they found a corpse inside a wax dummy in the “Laff in the Dark” ride while filming an episode of The Six Million Dollar Man. Thankfully I did not ride that one. For the award ceremonies all the marching bands piled into the Long Beach Arena and waited to hear if we won and award, Azusa often did, there was a lot of cheering and screaming at the top of our lungs. Not all of the parades were band reviews, and those had horses. 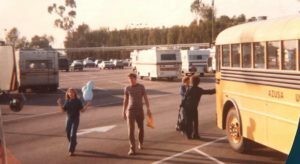 We would do a parade at Disney Land every year, the Azusa Golden Days Parade, and I think there was one or two others. If there was a pile of horse poo in the road we had to stay in rank and file and step in it. Did I say I hated parades with horses? When marching we had to remain focused on staying in form and on the music, looking around was not allowed. Faces forward. At one of our Disney trips my Grandma and Aunts happened to be there and were yelling a big hello to me, I didn’t look. The band was loud, I don’t remember hearing them either. She later told my parents how I ignored them. I always thought that was funny. At the end of my Junior year my Dad got a job for Inyo County and we moved to Bishop, California. I liked our new life but missed the competition from the band reviews. Bishop’s band was different and focused on the concert band. No band reviews and only one or two non competition parades a year. We did take week long a trip to Simi Valley for a concert band competition and tour the Hearst Castle. Bishop marching band did a drill down while rehearsing for an upcoming parade.There was one other member of the Bishop band who moved from a large school, He and I were the last two standing. A drill down is basically a competition within a band to follow the drum majors exact commands. If you fail to accuracy perform the command you fall out of line and stand on the side at attention. Last member standing wins. I don’t remember who won but I never got to the final 2 in Azusa! Being in High School Band holds some of my best memories from high school. Yup, I was a band geek. This entry was posted in Confessions of a Band Geek and tagged AHS, Azusa, Azusa Alumni, BUHS, flute, geek, Marching Band, music on August 1, 2018 by TetonTrekker.